Writing a letter is an amazing opportunity to get to know the child you sponsor on a personal level and build a deeper connection with them. The children at Rising Star are unique and have blossoming personalities. For example, Charles, 3rd standard, is an avid reader and has already read 15 books this year. Anbarasu, 12th standard, is very athletic and is not only a member of the sports club at school, but also finished running a marathon this year. Anjalai, 5th standard, is an energetic and outspoken girl that loves learning anything new. Murugan M., 7th standard, is a very cheerful young man who is happy when he is doing his best. 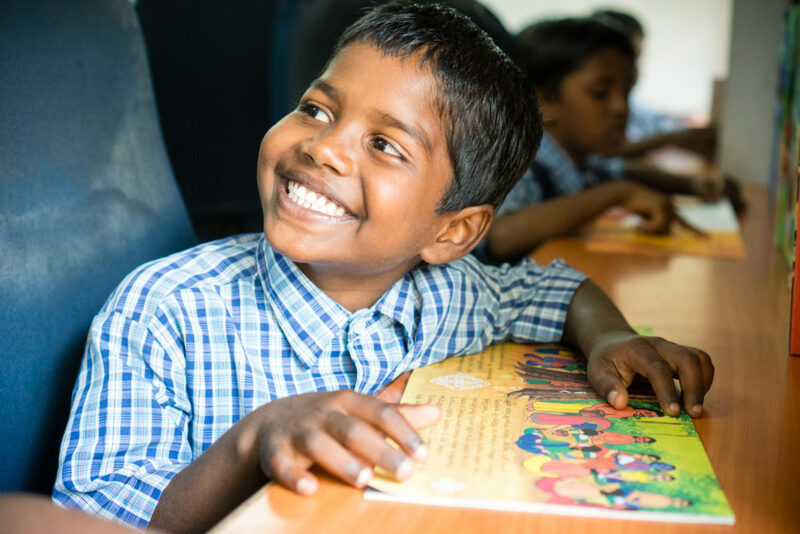 They love to hear from sponsors and receiving a letter makes them feel valued and loved. These connections will have lasting impacts on the life of both the child and sponsor, and writing to them is a great way to encourage them to pursue their goals. However, it can be difficult to know where to begin when it comes to writing letters. It can be hard to know exactly what to write to a child who lives a world away. To help, we’ve come up with a list of topics to ask your sponsored child about. Family. For most Indians, family is considered the most important social unit. Ask your child about their family and friends, and send them a picture of your own family! They love to know all of your names and a few insights about each family member. School. Ask them what they are learning and what they want to do in the future. What are their hopes and dream? Tell them why you feel learning is important or share a personal experience from your education. Share an experience. What is most important to you? The children are curious and love to hear about your lives and experiences. Sharing an experience with them that will help them get to know you better and helps them learn important social and emotional skills. The Weather. The average temperature in India is between 90-104 degree Fahrenheit, with the hottest time of the year typically being April. During the monsoon season, rainfall accounts for up to 80% of India’s annual rainfall. Ask the kids about it! Food. Ask them what their favorite meal is and how to prepare it, then spend a night trying it out with your family. Send them a simple recipe to try as well! Challenges. What challenges have you overcome? Share something with them that you’ve learned from your challenges and ask them what they’ve learned as well. These kinds of conversations can open up the door to get to know your child on a more personal level and can support them as they experience difficulties in their young lives. Daily life. Tell them about your daily routine and activities and ask them about their daily lives. You mind find differences and similarities that you’ve never thought of before! Current Events. At the beginning of each day, the students gather for a morning assembly. Part of that is spent relaying current events from India and around the world. Ask about the important current events occurring in their lives. What is happening in their community? Are their favorite sports team doing well? Tell them about a positive current event occurring in your community. Holidays. Holidays in India are important events and usually include large celebrations with family and friends. Ask your child about their favorite holidays and what they like to do on those special days. Do they eat certain foods or wear special clothes? Tell them about your favorite holidays as well. Express your love. These kids are unique, fun and vibrant individuals! Some of our children come from very difficult family or community circumstances, so your support matters in more ways than you may realize. Simply sharing that you care can make all the difference. As you’re writing letters, keep in mind that lots of the children are learning English as a second language. Reading your letters and responding to them helps accelerate their English skills. Don’t get discouraged if takes time to form a relationship. Even small notes of encouragement are welcomed and valued!